If you love your ski resort so much, why don’t you buy it? Mike and Kelly Stephenson never planned to get into the ski business. Mike was an agricultural consultant. Kelly, his wife, was a volunteer at Faith Assembly Christian Center. Sure, they loved skiing. They met in a one-in-a-million chairlift convergence at Schweitzer. And for the last 15 years, Mike has been an instructor at Bluewood, nestled in the Blue Mountains near Dayton, Wash. But when the resort was in trouble, they never expected it would be up to them to save it. Bluewood had never been a big or fancy resort. It boasts only 18 groomed runs, plus six open treed areas. 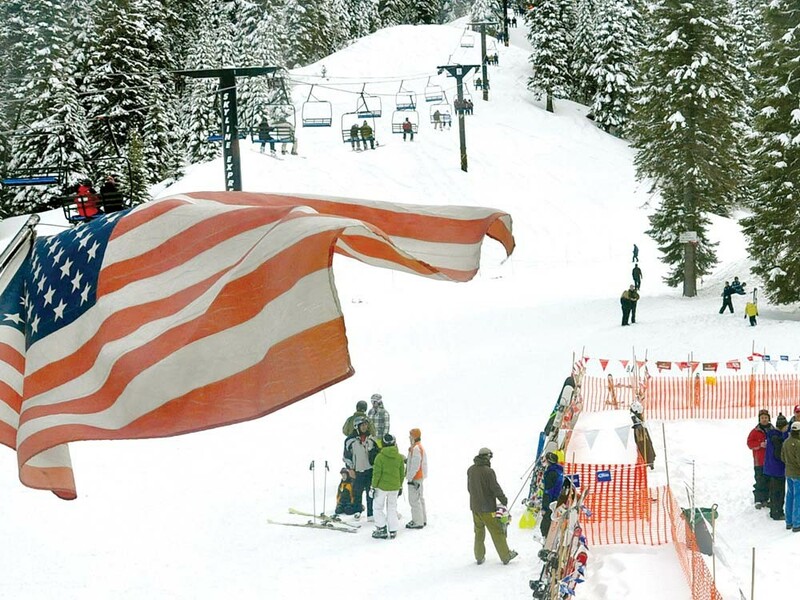 But it was the closest mountain around for skiers in the Walla Walla area, and at $42 per lift ticket, it offered some of the cheapest skiing in the state. Also, fairly often, it would receive the sort of snow dump that skiers would rave about for months. Opened in 1979, the mountain had been run by Stan and Nancy Goodell since 1983. That was a long time. For the Goodells: too long. “They wanted to retire,” Kelly says of the couple. The Goodells tried to sell Bluewood several times, but they could never find a buyer. So when the mountain closed last April, the lifts stopped — for good, it looked like. The Dayton area wouldn’t just lose an entertainment destination if Bluewood were to remain closed. It would lose tourism revenue and a location for young people to learn a new sport. For months, Mike Stephenson talked Bluewood up to potential investors, trying to get someone to buy it. But Kelly suspected that her husband was starting to think about purchasing it himself. The couple worried, though, that if the resort were to close for an entire year, it would remain closed forever. “If you lose a year, then you’re off everybody’s radar,” Kelly says. Soon everything began to fall into place, with investors lining up behind the Stephensons, offering to help them buy the resort. Ultimately, for Mike — a longtime youth ski instructor — it came down to caring about the young people in the area. Thanks to the Stephensons’ purchase, Bluewood remains a local, family-owned resort. Mike’s son, Travis, became the general manager. The former owners were elated. “They have known Mike for years,” Kelly says. But purchasing the resort was only the first step. By the time the sale went through in October, the Stephensons only had three months to restart the entire business. Inspections, legal arrangements, insurance paperwork, rehiring an entire staff — all this had to be completed before Bluewood could re-open. After a frenzied seven-days-a-week-for-three-months blitz, they did it. “It’s not something we recommend doing,” Kelly says. Thus far, the reopening has been a success. Around 200 skiers attended the first day of skiing at the new Bluewood on Dec. 3, and the peak attendance on the Wednesday after Christmas reached over 900. Kelly has big plans for the future of the resort. She wants to expand its offerings and create bike-riding trails for summer use. After all, only 500 of its 1,500 acres are currently being used. For the city of Dayton, the purchase of Bluewood came with a sigh of relief. For the Stephensons — the people who purchased it — it came as a surprise.